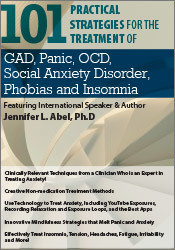 with JENNIFER L ABEL, PH.D. So many times in my practice I’ve met new clients who’ve seen multiple therapists and have tried an array of medications, only to continue to be plagued with unrelenting anxiety. When they show up at my office they are frustrated and nearly hopeless. After studying the latest research, working with experts in the field, and almost exclusively treating clients with anxiety disorders for more than 20 years, I can help even the most treatment resistant clients. Since the early days of my clinical career, I have developed creative, yet simple, methods that have been vital to providing relief for chronic anxiety. These techniques are easy to implement and can help your clients quickly achieve therapeutic results. Attend this two-day intensive seminar and develop the skills you need to help your clients overcome worry, panic attacks, phobias, OCD, social anxiety and insomnia. Through several demonstrations and hands-on exercises, you will develop the skills to help even the toughest anxious and sleep-deprived clients. We will explore progressive relaxation, observation and acceptance strategies, time-management, mindful labeling, postponing worry, interoceptive exposure, stimulus control, sleep-restriction therapy and much more. Then you will be glad you attended this conference! See you there!